I love food and the power it holds. Plus as you guys know I strongly believe in food as medicine, which is why I love this concept so much. Have you heard of seed cycling? Nope, I hadn't either. So I decided to look into it a little further, after all it is based around the food is medicine principle. 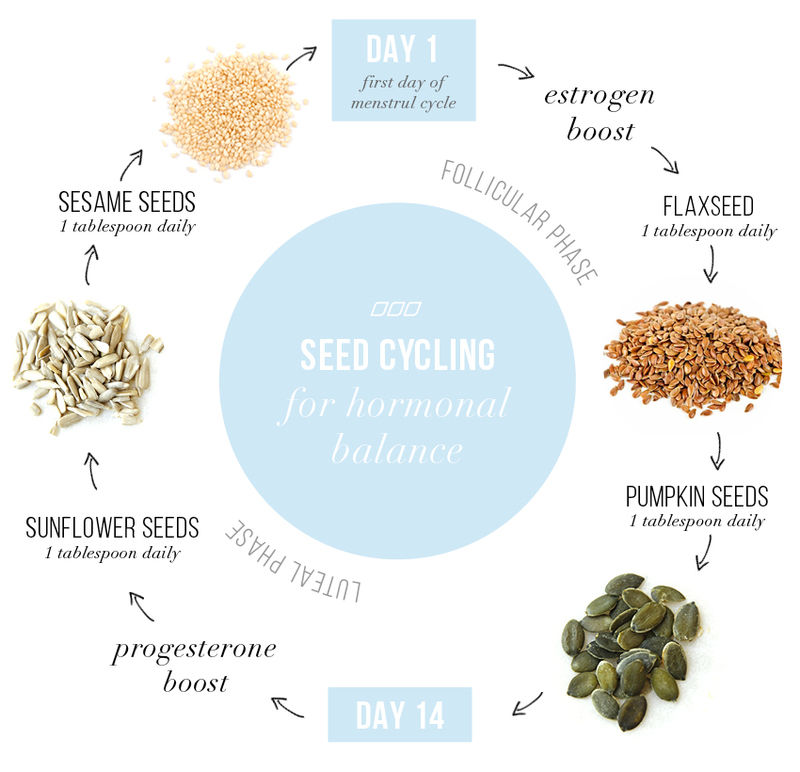 Seed cycling is being used to help balance womens hormones and it is a pretty easy concept. Basically you rotate certain seeds in and out of your diet and around the different phases of your menstrual cycle, to help balance progesterone and estrogen levels accordingly. Linseeds (also known as flaxseeds) - Contain lignans, these are thought to block excess estrogen. Pumpkin (pepita) seeds - Have a high amount of zinc helping the body release progesterone. Sunflower seeds -Also has a high amount of Zinc. Sesame seeds - High in selenium which is essential for happy and healthy hormones. A good blender or coffee grinder. During the follicular phase (the first half of the menstrual cycle), use 1 tbsp of linseed and 1 tbsp of pumpkin seeds. During the luteal phase (the second half of the menstrual cycle), switch to 1 tbsp of sesame seeds and 1 tbsp of sunflower seeds. If your menstrual cycle is irregular you are to follow the cycle of the moon. However I think the easiest way is for 1 - 14 days use linseed and pumpkin seeds. 15 - 28 days switch to sesame and sunflower seeds. This will help get those hormones firing again. It may take 3+ months to notice any changes in your cycle. Aim to consume 2 tbsp of ground seeds per day. Store your seeds in the fridge for extra freshness. Good luck and remember this is just a stepping stone to creating health and happy hormones. You may like to seek professional advice for further guidance. If this blog post resinates with you, and you want to learn more about creating healthy and happy hormones. Click here to find out how we can work together. Your Guide to Buying Supplements.